Dubai is an amazing city with so much to see and do. 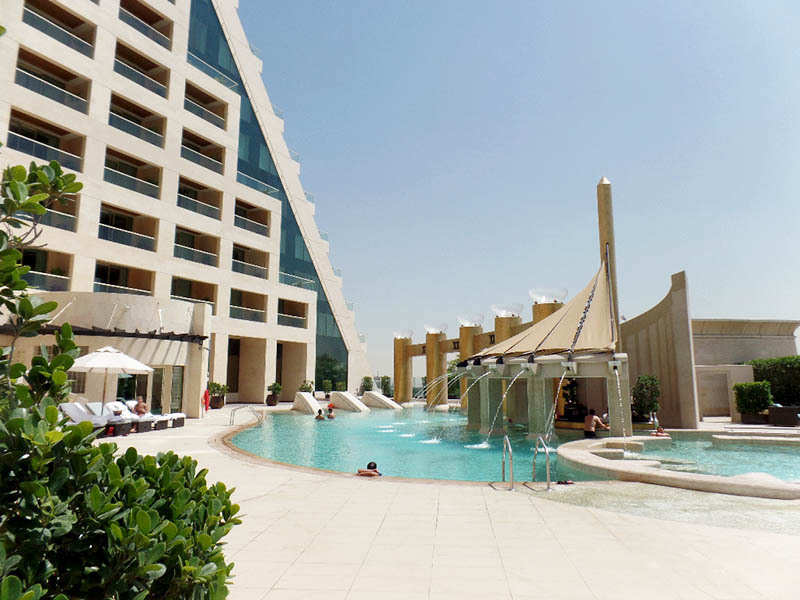 In the center of it all, near to the beaches and top shopping malls, is the area known as WAFI where you’ll find an icon of architecture and hospitality, the Raffles Dubai. This stunning Egyptian pyramid is as much a landmark as it is a hotel. Everything about this place is gargantuan, from the lobby, the rooms, and all of the venues which are grand in size and décor. The tastefully Egyptian esthetic melds with modern interiors and you’ll find delightful art pieces throughout the property and in each room. As you enter the property, you’ll find Rolls Royces, Bentleys, Ferraris and Lamborghinis, many with plates from nearby Arab countries. 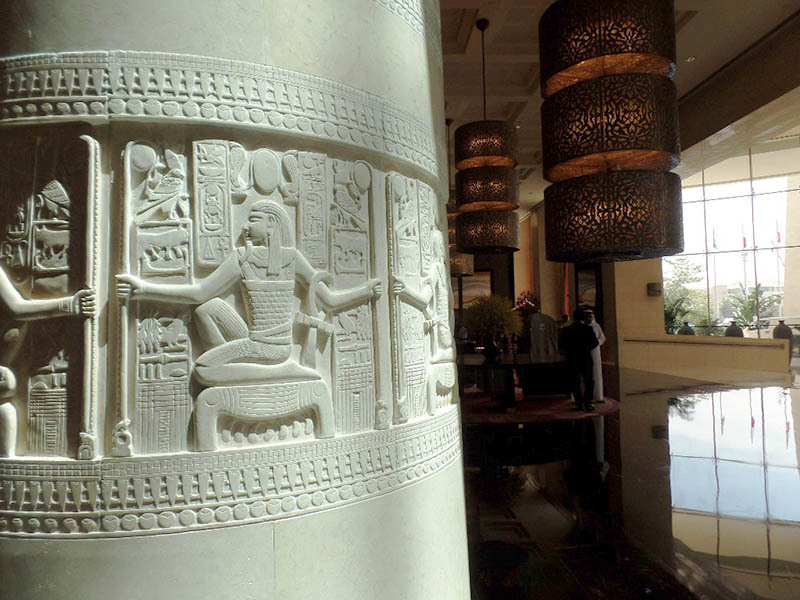 Inside you will be immediately struck by the grandeur of the lobby with its five story atrium and tall granite columns with the Egyptian etchings. Raffles Dubai is a marvel fit for the Pharaohs, with exquisite stained glass, intricate mosaics, carvings and sculptures at every turn. 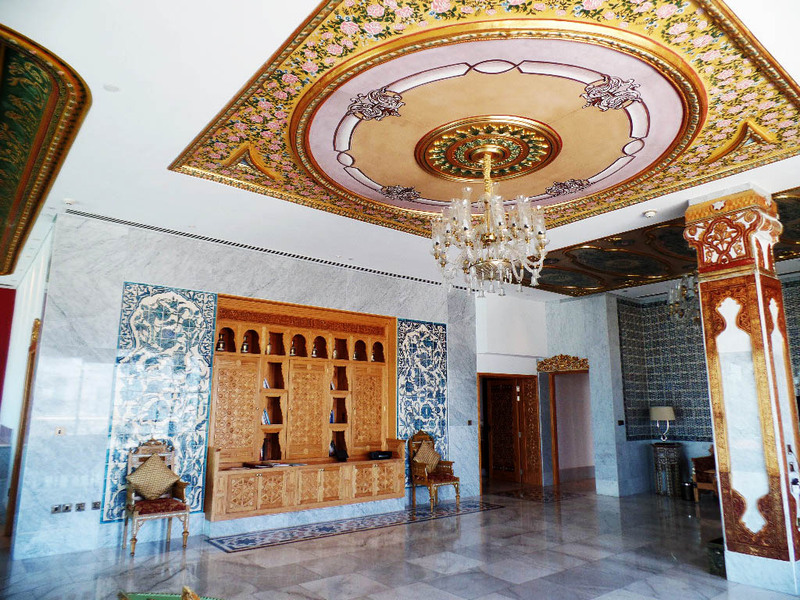 The main influences of the interior decorations comes a blend of Middle Eastern and Asian designs with emphasis on the four elements of life: earth, air, fire and water. There is a lovely lobby reception and coffee area with tourists and locals sitting closing business deals or friends meeting up for a chat. After a quick check in I was escorted to my room by the bellman. As the doors opened, I was immediately impressed. The room was attractively decorated with earth tones with dark woods and crimson pops of color. Like the hotel, the rooms are massive and are 70 square meters for the standard room which is the size of most hotel suites. I was greeted by a plate of treats and a personal card from the General Manager Ayman Gharib, which I thought was a nice touch. The sitting area is comfortably designed with large couches, a desk and entertainment area. 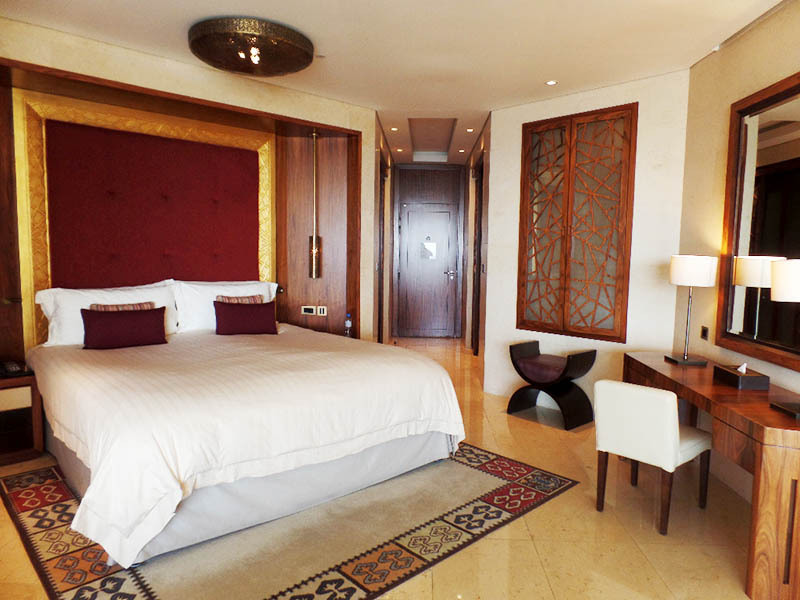 The rooms are very high tech with an interactive entertainment system and smart device gadgets to control music and TV. 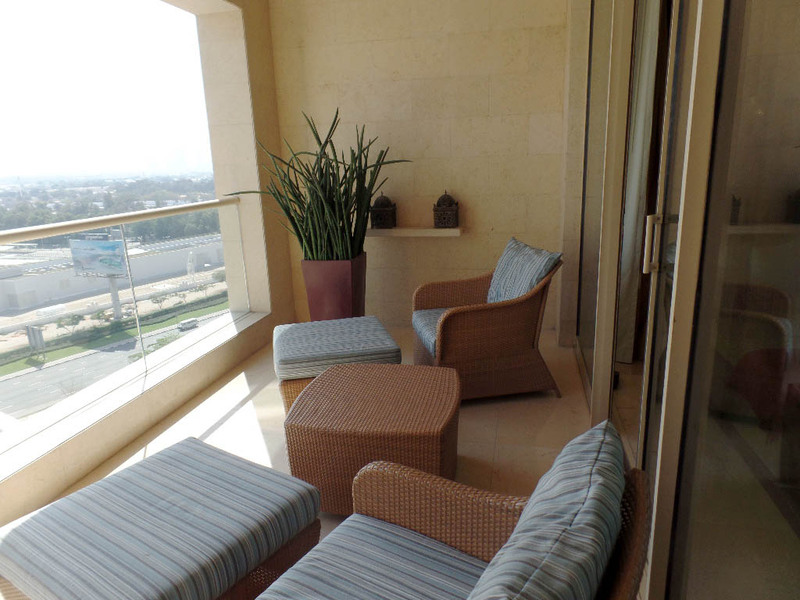 Just beyond the sitting area is a large terrace with a spacious sitting area that overlooked the Dubai skyline. At night I enjoyed sitting on the terrace with a glass of wine. 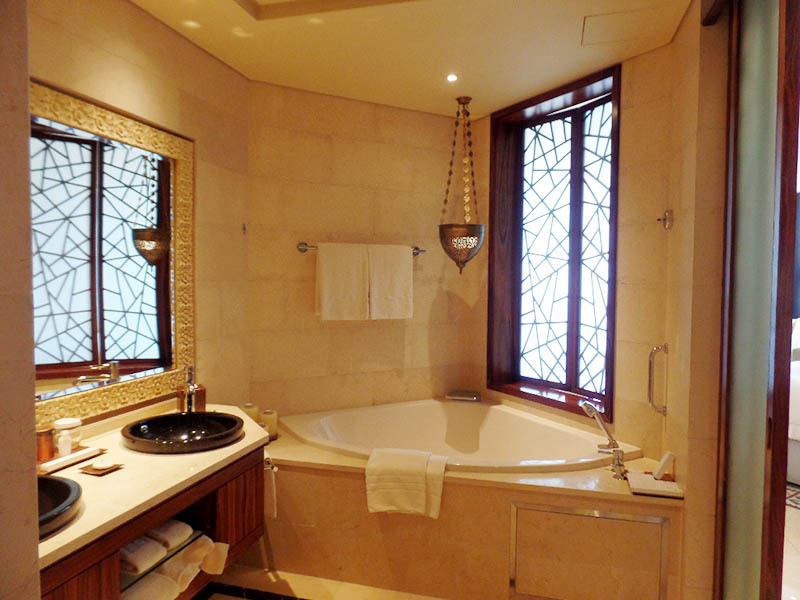 The bathrooms are as spectacular as the rooms, with huge soaking bathroom tub, separate rain shower with sitting area so that you can just relax and let the refreshing shower smoothly away your worry and stress. 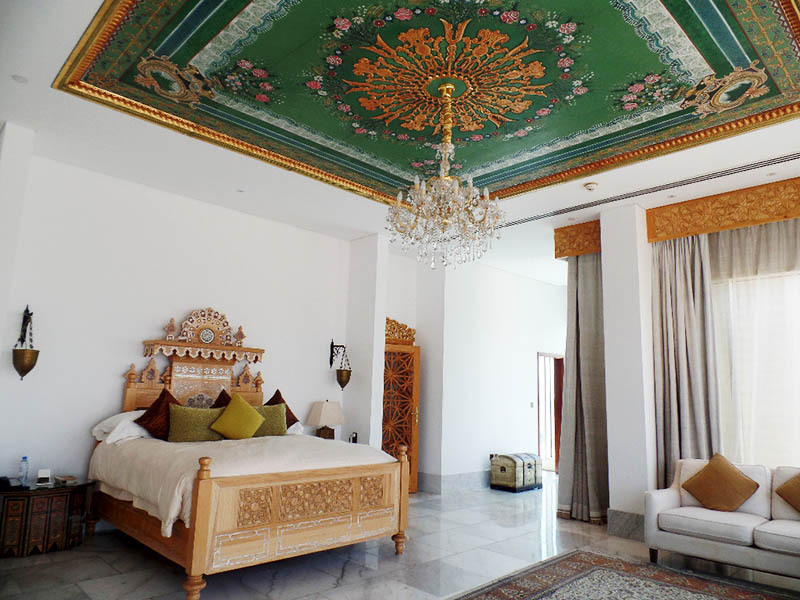 For those looking to spread out even more, there are various suites designed for those who want to “live large.” These are themed for various countries, from Morocco to Turkey. 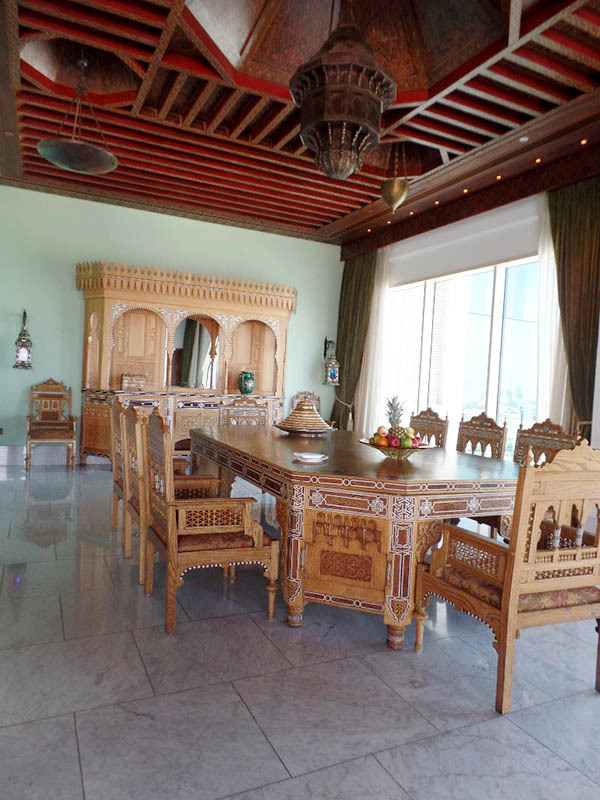 Truly amazing rooms fit for a sultan with ornate décor, large dining areas, entertainment spaces and wrap-around balconies overlooking the Dubai skyline. After a relaxing bath and refreshing nap, I decided to get out and explore a bit. The WAFI area of Dubai is a multi-faceted village within a city with unique Egyptian architecture design. There is a mix of retail, entertainment, dining, health and leisure and residential facilities. WAFI is renowned for its haute couture, the range of fashion, jewelry, gifts, home and interior accessories. 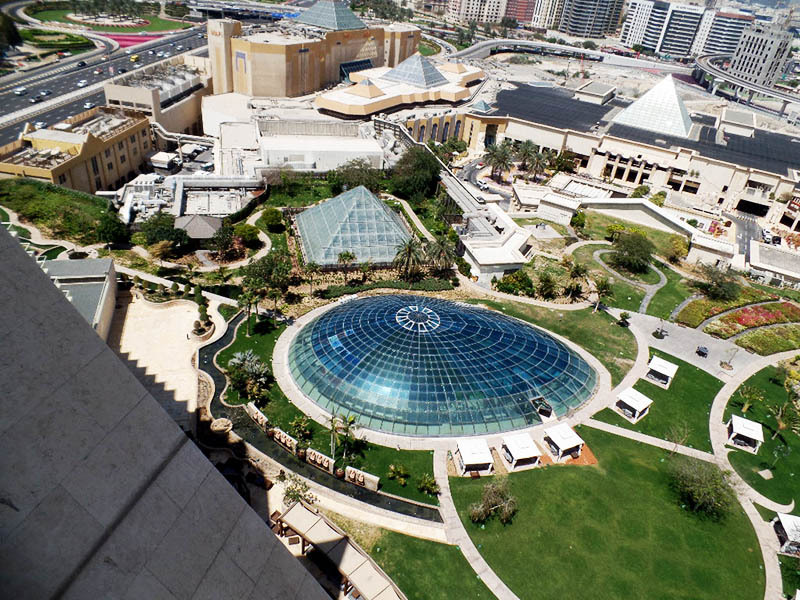 A key element of this area is the WAFI Mall which is connected by a corridor to the hotel. 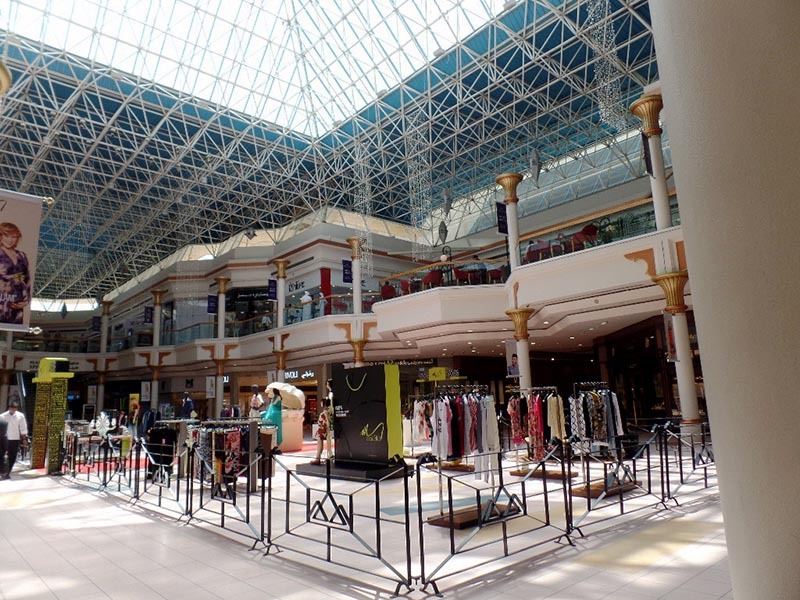 It has some of Dubai’s best luxury shopping, with over 350 shops, more than 30 restaurants and its own leisure complex. After a stroll around the mall, I went back to the hotel. The sun was starting to dip so I decided to take a quick splash in the pool. I’ve been to a lot of hotel pools but this one was really unique. Sitting high about the ground below, the pool welcomed sun-worshiping guests. This pool was clearly a work of art and the designer put just as much emphasis on designing this area as much as the rest of the resort. 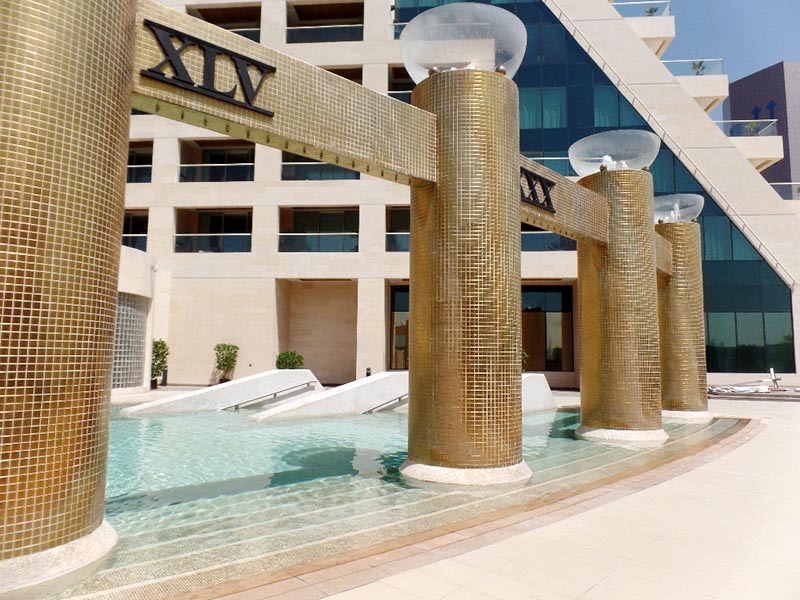 On one side of the oval shaped pool there are massive shiny gold columns with Roman numerals in front of a stairway into the pool. Next to that there is a pool bar where guest sipped on frosty umbrella adorned libations. There are water spouts over the bar. 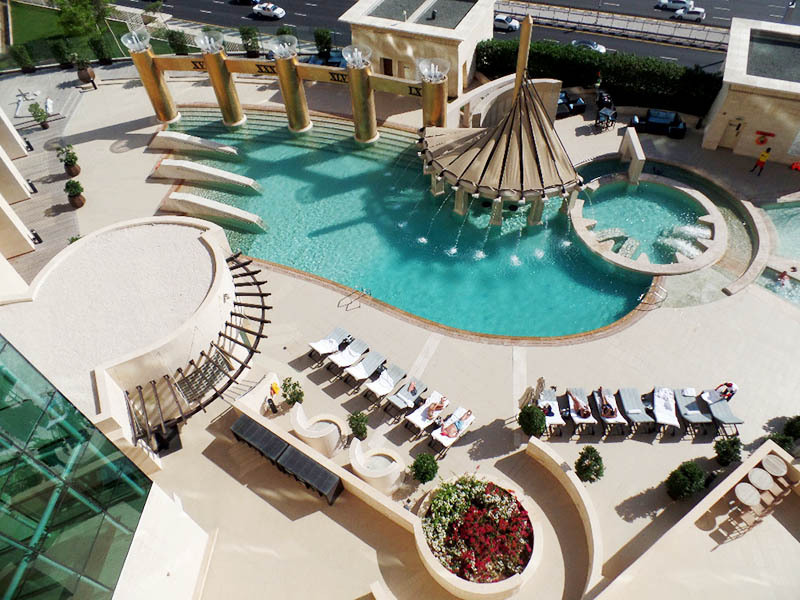 Couples, friends and families lounged around the pool sun bathing as attendants checked in offering drinks, snacks and towels. Later in the day, I decided to see what other surprises the hotel had to offer. I had a chance to delight in the Fashion Tea that they have each day at 4 p.m. What they’ve created is something truly unique and it’s a tea with a fashion theme. 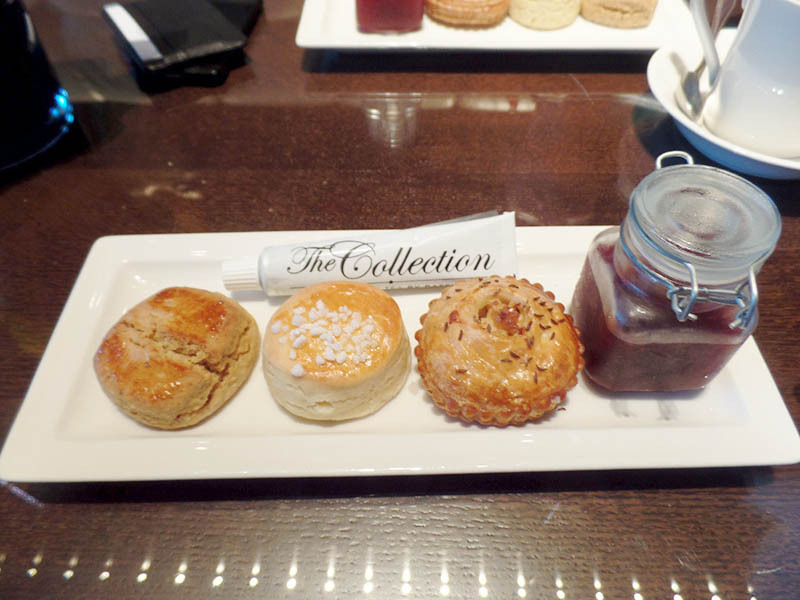 The service begins with trays of scones, tea sandwiches and then culminates with the tower of sweets. 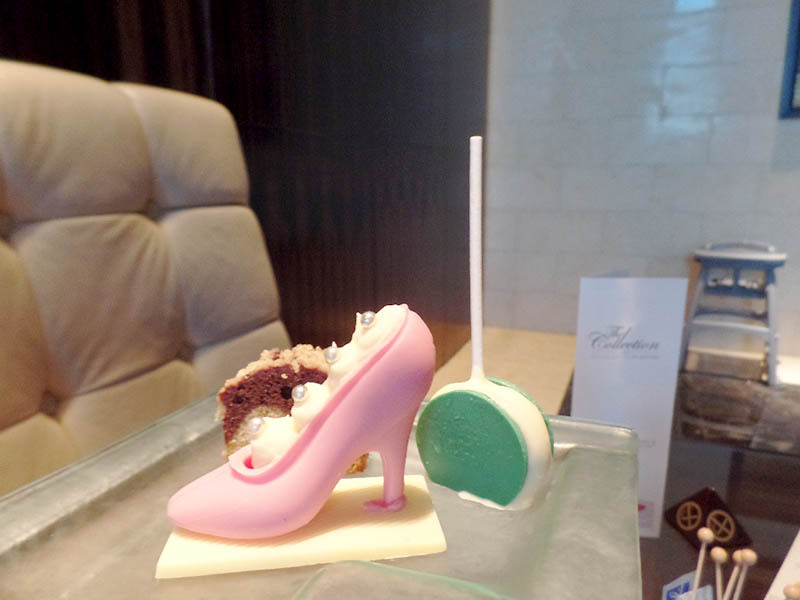 The deserts are fashioned like shoes and handbags, and they are 100% fun for all. 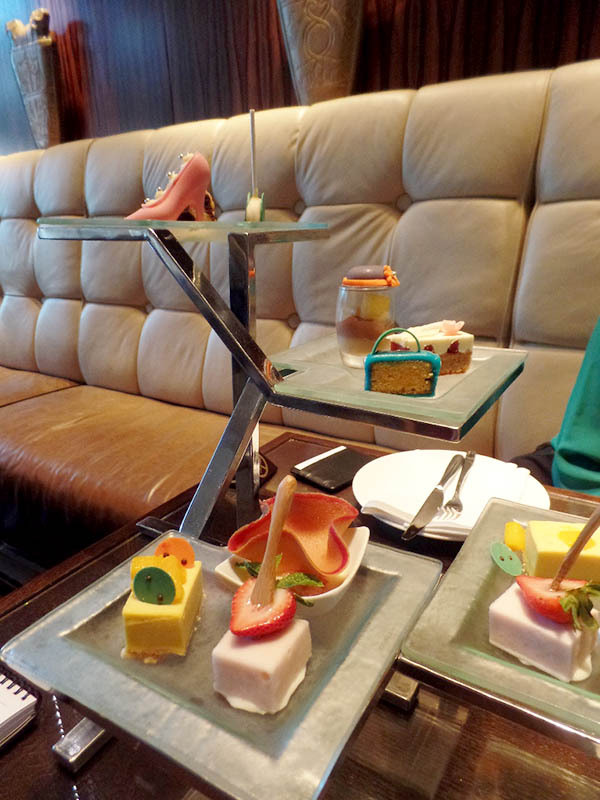 It’s the perfect place to take tea for ladies getting together to share the latest gossip or anyone who can appreciate this creative masterpiece by Raffles Executive Pastry Chef Roland Eitzinger who has combined the love of food with art. 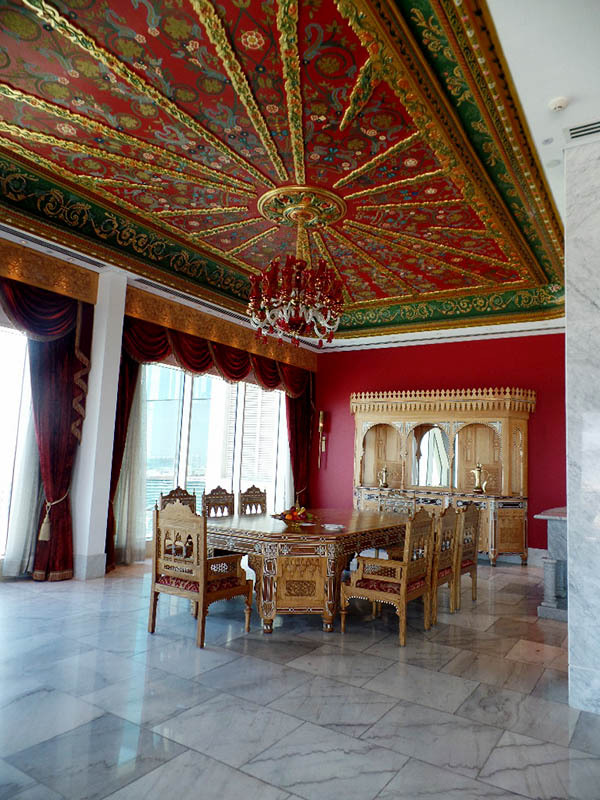 Raffles Dubai truly exceeds the expectations of even the most well-heeled traveler. After a deep and thoroughly peaceful sleep on the comfy king size bed it was time to rise and shine and have a quick workout. There is a comprehensive gym with every machine that the fit guest could desire. 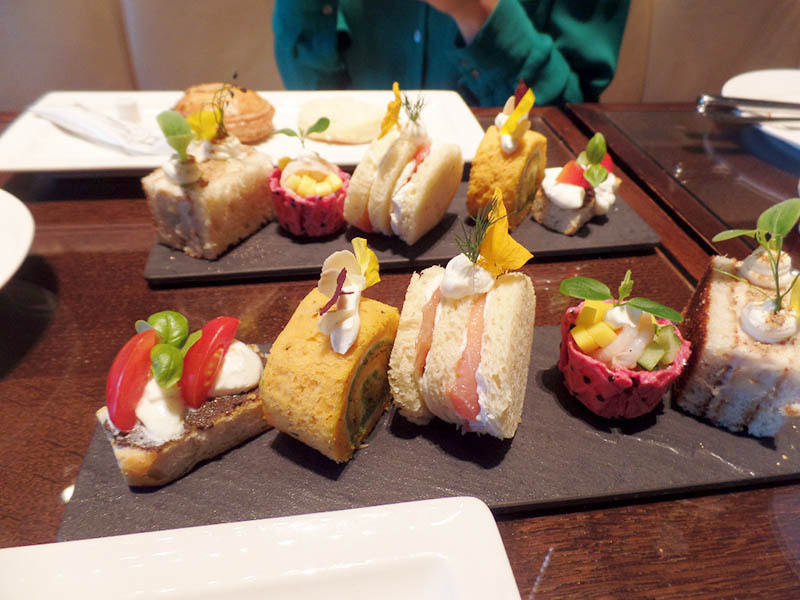 Then it was off to breakfast at the main restaurant, Azur. It was another feast-like spread with livarious cooking stations and a really imaginative offering of dishes, from waffles to curry dishes. My favorites were the omelet made to my order and the fresh fruit. The property offers many dining options, from French to Japanese. For entertainment they have their Crossroads Cocktail Bar with indoor and outdoor seating, perfect for conversations with friends over drinks. There is also one of Dubai’s most popular night clubs, People by Crystal, which hosts Dubai’s most glamorous party-goers. 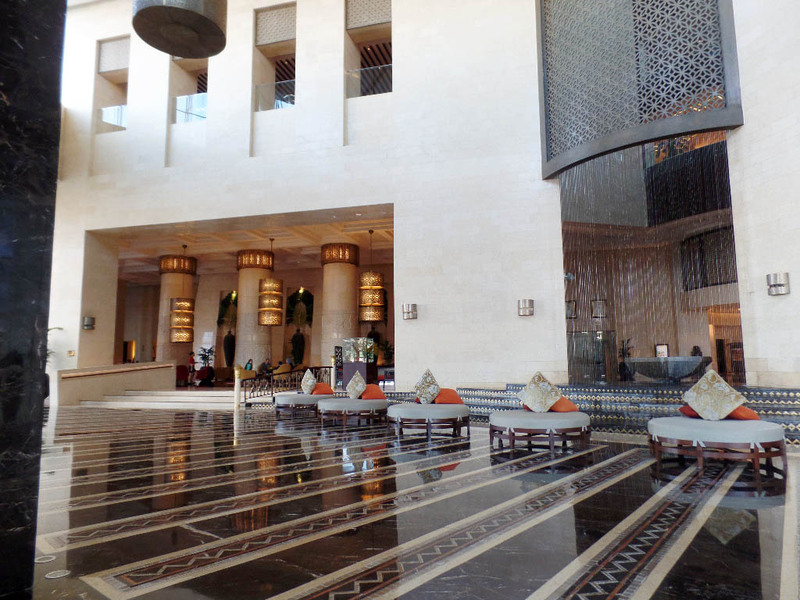 The Raffles Dubai is impressive from start to finish. Fantastic location, services that set a new standard and accommodations and amenities with every bell and whistle. 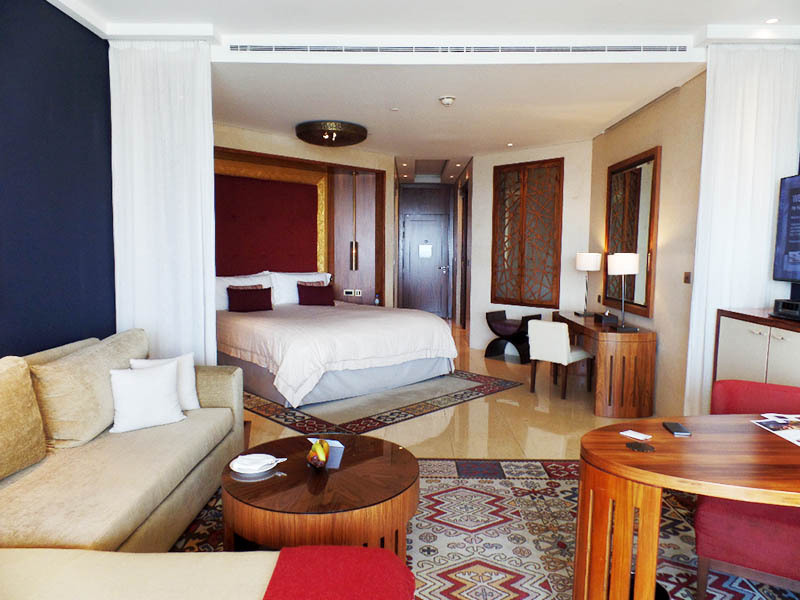 For those looking for a great place to enjoy Dubai, the Raffles Dubai is a magnificent choice.